His aim is to share rare and beautiful natural and wild areas with guests while making minimal environmental impact. A portion of the proceeds are donated annually to local environmental causes. 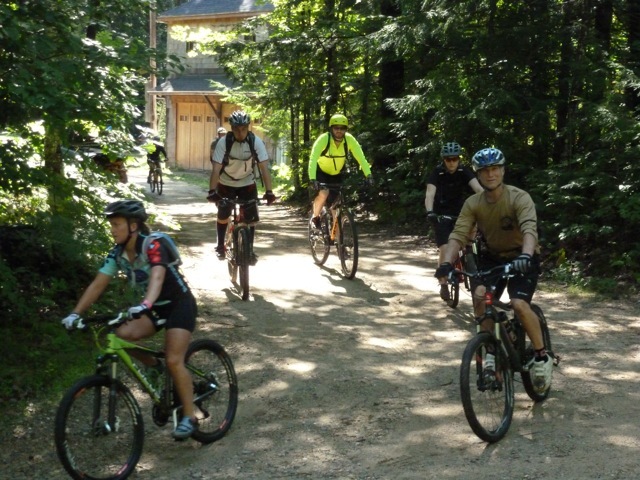 Since BCE is located in a remote, secluded area in the foothills of the White Mountains, the center is a mecca for mountain biking enthusiasts of all abilities. The rich diversity of trail systems offers exceptional recreational riding, while also providing an excellent opportunity for multi-sport adventures. A fleet of bikes, canoes and innertubes is always ready to go! Fantastic trails, guided group rides, personal service, and a wide variety of interesting terrain and topography for all abilities is what you can expect. We're way off the beaten path so sit back and relax. There's never any pressure here. This is an informal, relaxed place. Folks come to share excitement, stories, and adventure while enjoying great food and friends in a kindred dirt-riding spirit. Email or Call ahead. We offer full, half day, and Season's Passes. Check Tours & Events for all details. Unless you have purchased a Season's Pass from us, all trail access using our operations is guided and with prior reservation. It is not recommended to just show up here without prior contact. Our fees are based upon 4 main components: (1) Education and instruction, (2) Bike rental, repairs and maintenance, (3) Leading and guiding trail rides, and (4) Designing and maintaining miles of trails appropriately designed for different skill levels. We also have accomodations that are basic and provided for the convenience of those who wish to ride. We do not accept guests who are not here for the ride.